During Apple’s Worldwide Developers Conference (WWDC 2012) which took place in California earlier today the company announced several new products including what it calls a “next-generation” MacBook Pro, with a Retina super high resolution display unlike anything which currently exist in the commercial computer industry. 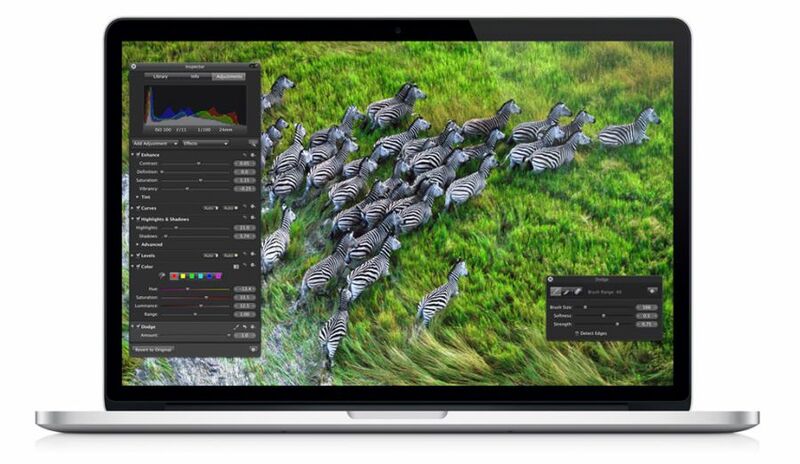 The MacBook Pro with Retina Display uses a 15.4 inch IPS display with an unprecedented resolution (for this screen size) of 2880 over 1800 pixels or 220 points per inch (which according to apple should out resolve the human eye from the relevant viewing distance). The pixels on the new display are actually so small that you should be incapable of viewing them with the naked eye. What can you do with a display with such high resolution? a few things come to mind: displaying and editing high resolution images will be very high up in the list – with the capability of showing over 5 MegaPixels, there is simply nothing that come close to it on the consumer market (even a 30″ pro monitors only have 2560 over 1600 pixels of resolution). Video editors will also likely appreciate the high resolution which will enable them to view a full 1080p video while still having a lot of free screen real-estate to work with. What else does the new The MacBook Pro with Retina display have besides the display itself? the answer is quite a lot actually. Apple’s engineers tried to develop the MacBook Pro Retina from the ground up including many new custom made components essential to squeezing such an array of advanced components into an ultra thin body (the new MacBook Pro with Retina is only 0.71 inch in height – much less than the older MacBook Pro and very similar to the MacBook Air). Display: 15.4-inch IPS panel with wide viewing angles (178 degrees) and 2,880×1,800 resolution (5.18 Megapixels) and 220 pixels per inch. Processor: Quad-core Core i7 Ivy Bridge (either 2.3GHz or 2.6GHz/2.7GHz). Memory (RAM): 8GB or 16GB of 1600MHz DDR3L memory. Graphics (GPU): Intel HD Graphics 4000 + the new NVIDIA GeForce GT 650M (Kepler graphics architecture) with 1GB of GDDR5 memory and automatic graphics switching. Storage: 256GB / 512GB / 756GB of SSD. Connections: HDMI, SDXC card reader, 2 USB3, 2 Thunderbolt (an option to use an Thunderbolt to Gigabit Ethernet or Thunderbolt to FireWire 800 Adapter exists; the adapter is sold separately). Battery: Lithium ion good for up to 7 hours according to apple (with a new MagSafe 2 power adapter – not compatible with previous units without an adapter). Camera: 720p FaceTime HD front facing camera. Wireless: 802.11n (backwards compatible with IEEE 802.11a/b/g but not compatible with the new 802.11ac standard). Bluetooth 4.0 wireless technology compatibility (like the new iPad). Audio: Built in stereo speakers, and more interestingly, dual microphones (for reducing background noise from behind the notebook). Only one headphone jack and no external microphone input. Size and weight: Height: 0.71 inch, width: 14.13 inches, depth: 9.73 inches, weight: 4.46 pounds. Pricing: 2200 – 2800 USD (depending on the configuration).